Citizen strengthens its commitment to India with their new brand ambassador Kevin Pietersen at an event in New Delhi. Kevin Pietersen is one of the finest batsmen in global cricketing arena today, his sophistication & style superbly personifies the brand. Cricket is a celebrated sport across the world today and Citizen's association with the sport by introducing Kevin Pietersen as the brand ambassador reinforces their commitment to reach out to a global market. Citizen is hereby shouldering the responsibility to help cultivate a culture of positive change and an ongoing evolution through a new chapter of watchmaking craftsmanship. Mr. Katsusuke Tokura, MD, Citizen Watches (India) Pvt. Ltd. said, “We are delighted to have Kevin Pietersen here today at the event. Citizen has always been associated with sports, personifying the spirit of sportsmanship, confidence and independence of the Eco drive collection. He further added, “Citizen has always considered India as an important market. Our target-consumer in India is the ‘new rich young generation’ who is financially independent, style-conscious, as well as seeks real value and appreciates new technologies. Citizen has plans to bring out several contemporary designs year on year. Eco drive collection from Citizen is the perfect combination of innovation and smart technologies.The revolutionary technology of Citizen Eco Drive Collection has successfully used futuristic environment-friendly concepts that power the watch to function anytime and anywhere as long as there is light. 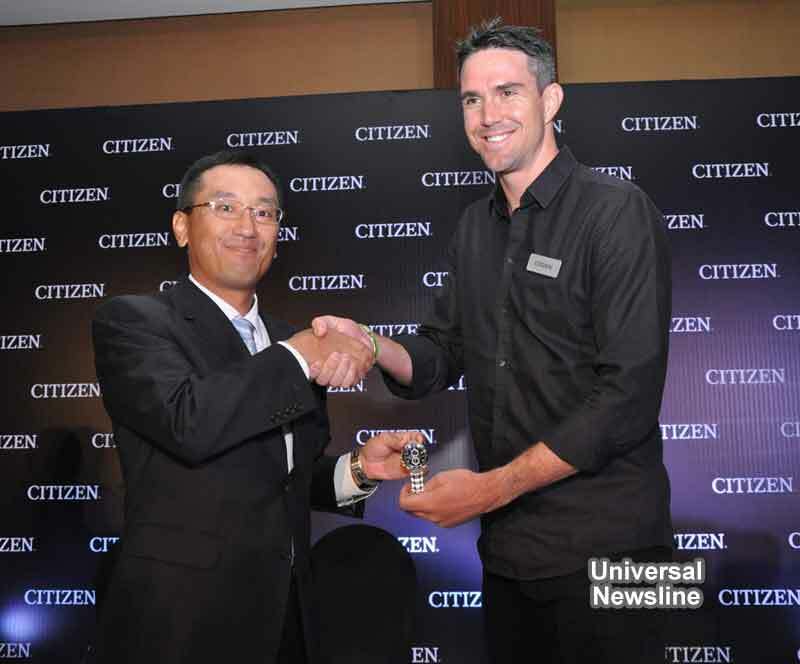 On the occasion, Kevin Pietersen said, “I am delighted to join as the new face of Citizen in India. Citizen has always had a strong association with sports in the past and I am greatly honoured to be a part of this great global brand”. He added, “Cricket is all about timing and only with timing does a cricketer fulfill his full potential. Citizen has also grown with time; I see my association with them noteworthy, as I see Citizen in me”. CITIZEN WATCHES HOLDINGS Co. Ltd of Japan, a JPY 279.7 Billion (US $ 3 Billion), multinational company with a 82 year heritage, sells world-class watches and allied products in more than 150 countries worldwide. CITIZEN WATCHES (India) Pvt. Ltd., entered India in 1997 and was heralded by the revolutionary Eco-Drive - light powered watches, lending an air of excitement and expectation around the CITIZEN brand name and adding to the excellent equity CITIZEN already enjoyed in India.